TLA » Licensing back in fashion! Contact us to learn about exciting opportunities! Licensing back in fashion! Contact us to learn about exciting opportunities! The use of licensed characters in promotions was a mainstay of the industry for many years, but then collapsed. Recently, however, we’ve seen a resurgence of interest.Yes, there are some relatively straightforward ‘slap it on the pack’ promotions out there: but the best licensed promotions today are those where agencies get creative with the equity on offer. If done well, the licensed property itself benefits hugely from the exposure, while the brand gets to borrow some reflected glory to create a campaign that would not otherwise have been possible. Last year, the 2010 Licensing Awards featured a category for ‘Best Use of a Licensed Property in a Marketing Communication’, and the top ten nominations demonstrated the high levels of creativity licensed promotions now deliver, covering an extremely diverse range of goods and services with some truly excellent executions. I defy you not to laugh as Postman Pat takes large lumps out of Greendale with Jess squashed against the windscreen of his van, and all because he didn’t go to Specsavers! 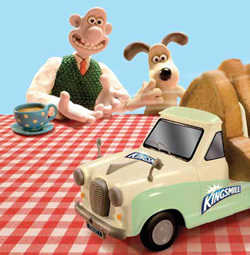 The Silver and Gold award-winning campaigns both featured Wallace & Gromit, for N-Power and Kingsmill respectively. Both campaigns massively over-achieved against business objectives, which the promoters put down to the creative use of the well-loved duo. Using Wallace & Gromit is always going to be a fairly safe bet, for the brand-owner, at least. It can be a much bigger decision for the property owner, however: by associating with a commercial brand, they run the risk of being accused of cynicism by the public, while there is also a danger that the property may lose credibility if the creative isn’t at least as good as the show itself. Other entrants also showed how using a licence is one of the most potent ways of giving a marketing or promotional campaign a real point of difference. Asda fresh produce linked with the pre-school TV show ‘Lazy Town’, with a message that had obvious benefits for both partners, while really well executed promotions partnering Pizza Hut with the film Terminator Salvation and Peppa Pig with Muller Little Stars showed that even the simplest promotional mechanics can rise above the pack by the creative use of a licence. I believe that the licensing industry is becoming a place where the promoter and their agency can feel a little more at home. For the licensor, there is a growing understanding of the value of the additional exposure a promotional campaign with a major brand can bring, above and beyond any fee for the use of the Intellectual Property. I also think that property owners are prepared to be more flexible with how their characters are used – indeed, if this were not the case, then the Specsavers/Postman Pat campaign would never have been made, Windy Miller would never have sat down with a bowl of Quaker Oats and Paddington would never have spread Marmite on his toast instead of Marmalade. On the other side of the table, brand owners and agencies are much more open and willing to have discussions about the creative use of characters and properties with rights owners who understand the benefits to them, and who are not looking for exorbitant fees. Licensed properties can be excellent partners for brands, offering a great way to access a promoter’s existing target market or even break into a new market with a readymade set of creative resources.